Right away, I should make it clear that I have not read the first few volumes of the manga, and the ones that I have read are Mixxine only. I have read translations for all the first-season volumes, and researched in depth, but it is possible that I may misinterpret a translation or otherwise make an error. This is the reason that my Nephrite and Jadeite parts of this section are less in-depth than are the ones on Kunzite, Zoisite, and, to a lesser extent, Beryl, Metallia, and Endymion. And, as a predominantly anime fan, I am also going to do extensive comparison to the anime. Most people are more familiar with the anime, anyway, so I'm just working on making it make sense. Just to be completely and totally honest with y'all. Also to be honest, I am not a huge manga-DK fan. Take that as you will. Right. On with the show. Or, more precisely, on with the Dark Kingdom of Takeuchi Naoko's manga Bishoujo Senshi Sailormoon, as seen acts 1-10. And because I enjoy being thorough, this is a rather long shrine. Beware. Or look forward to it, depending on whether you see the glass as half-full or half-empty. All righty. Firstly, we're going to take a look at each of the characters individually. This is the dark king known as Jaedaito. Cute, isn't he? ...well, in some pictures he is. And in some he just looks evil. Just like in the anime! And also as in the anime, he was the first of the Shitennou sent out to pursue the Dark Kingdom's interests on earth. Some of his victims were similar -- Naru's mom, Ami's school, Rei's shrine. But that was it. He simply didn't have enough time to do any more in the manga. Think thirteen episodes was not enough? Try three acts! An even more crucial difference from the number appearances, however, was that Jadeite was not on a quest for energy, but rather, the elusive and much-desired ginzuishou. He did not find it. Is anyone horribly, horribly surprised? 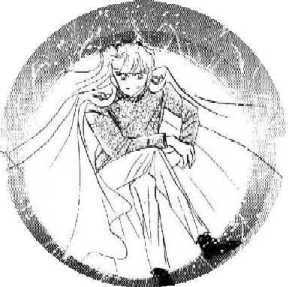 Manga Jadeite was an awfully nasty guy, though, from what I understand, givin' even his anime counterpart a run for his money by talkin' about sacrifices and generally doing some pretty malicious things. So when Sailormars burns him to a crisp at her first appearance (a phenomenon which will become quite repetitive with the next few kings as well), it's not terribly traumatic. He was a jerk. A good lookin' jerk, at times -- look at the bus-driving picture! But a jerk nonetheless. And who was upset over his death? 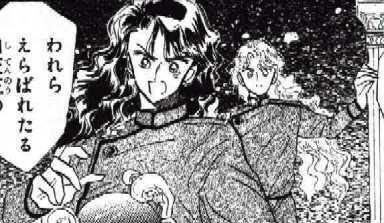 Why, Nephrite and Zoisite, who had already made their first appearances. 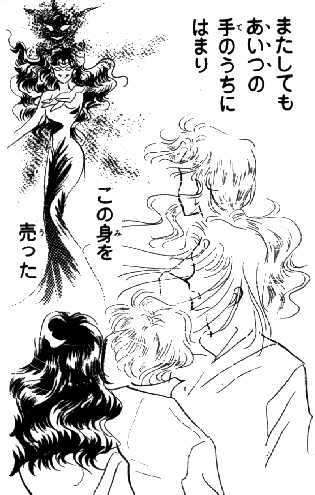 While Nephrite initially premiered as saying that Jadeite's methods were unsound and that he, Nephrite, should take over, this was mostly due to worry on Nephrite's part that Jadeite would be killed, as Beryl had threatened, for his failures. Yeah, Beryl's kind of similar in the anime, but in the manga she never gets to act on any of her threats. I'm not sure if that's a good or a bad thing. So Jadeite was dead, and now it was time for the next king to try his hand at obtaining the ginzuishou. Yes, this was our beloved Dark Kingdom no Shitennou Nefuraito. Well, anyway, it was in this latter location that young Kino Makoto discovered her powers as Sailorjupiter, and fried dear Nephrite with a flower hurricane. And so he was dead. 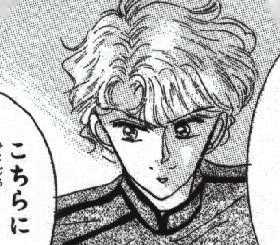 If you'll notice in the most recent scan, there is another boy behind our Nephrite, whose face seems filled with concern, rather than animosity. Yes, despite the fact that his hair is not pulled back (who knew it was that long? ), this is Nephrite's successor king Zoisaito. There was no rivalry between these two in the manga -- only the camaraderie that all four kings seemed to share -- and likewise, I don't believe Usagi-chan's best friend Naru even once laid eyes on the auburn-tressed warrior. Sanjouin Masato did not exist. To further expound on that idea, Nephrite's tenure as active king barely existed. 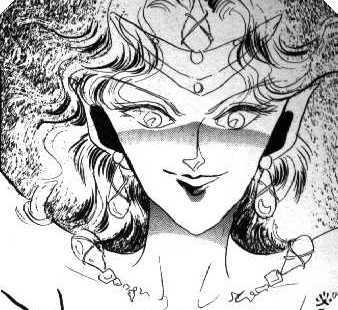 Which is, in my opinion, a pity -- I really like the way Takeuchi-san depicted Nephrite in the manga. His hair, particularly, was quite nice. It's too bad his character didn't have nearly that kind of volume. But then, none of the Dark Kingdom characters did. 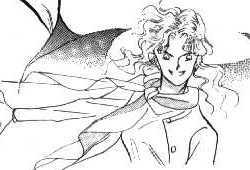 Even in his little time, though, Nephrite still had the seeds of the way he would become in the anime. He still appears to be rather cocky, rather casual about what he does, and look! He even drinks! This has, so far, been half the Shitennou, and, coincidentally, half the acts which make up the Dark Kingdom arc of the manga. At this point, the Dark Kingdom has had very little development, both in character and in plot in general. The latter can be said for the anime's Dark Kingdom as well, but the former cannot, or at least, cannot to the extent that was true in the situation. Now that the Shitennou have reached the halfway mark, let's meet the one who came next. Zoisite was never a king on his own, despite the deaths of the two kings he'd been seen with earlier. 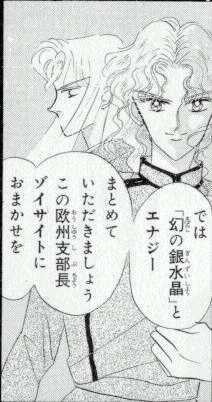 On the same page that Nephrite bites the dust, a new king is introduced, who tells Zoisite to be careful lest he [Zoi] shares the same fate. The next time we see this fair young soul he is watching TV. Yes, TV. Apparently, that's how they find out things in the Dark Kingdom. Incidentally, you can find this scan on my about this page section; I'm not going to include it here. Zoisite's initial plan involved using some sort of hypnosis to make the people do his bidding and find the ginzuishou for him -- he dressed up as a prestigious (female) professor and told tales of the eternal life and power promised by the ginzuishou. And the people searched. When they didn't find it, he drained their energy via TV. His second plan involved a "Video Shop Dark" with subliminal messages in videotapes, and ended up being much the same as the first plan. The difference is that at this point, the DK suspected Sailormoon may have the crystal, so he sent people against her. When that didn't work, he went after her himself. He grabbed her, but... but a very sharp boomerang sent by the lovely ex-Sailor-V (and now Sailorvenus in disguise as the Moon Princess) sliced him to pieces. Ah, it's only now come to my notice that I have said very little about the fourth king, the lord Kuntsuaito (I generally take the liberty of spelling this romanji "Kunzaito", but according to my trusty Japanese dictionary, his name uses the "tsu", not the "za" katakana...). This is because Kunzite is not nearly as entangled with the beguiling green-eyed king as he is in the anime. Despite the couple panels where they are situated quite near each other, there is no text in the manga which supports the fact that they are a couple as they are in the anime. However, I do have a sneaking suspicion that it is the few panels that show them together that may have given Toei the idea for the Sailormoon anime. I mean, come on, they're cute when they're together! ...sorry. I won't do that again. "Unlike in the anime, the manga Zoisite was not gay." 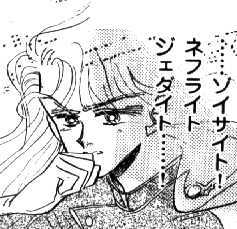 Maybe he wasn't with Kunzite (and indeed, never uses the honorific "-sama" to him), but he was far from the model of heterosexual masculinity. He disguised himself as a woman, after all! Is that normal? Granted, Professor Izono -- the false name he used -- was described as gorgeous, but... well, it basically looked like Zoisite (who is, of course, gorgeous, but still...) with lipstick, purse-shaped earrings, and a false rack. And his transvestism in this case was far different from what he did in the anime -- in the anime, it was a necessity to wear a form-and-face altering disguise to specifically lure out Tuxedo Kamen; in the manga, there was no reason why he couldn't have worn men's clothes. Psychology books often say that most transvestites are heterosexuals who just think they look pretty in their wives' underwear; however, this was not the kind of dressing up Zoisite did. Like I said, I'm not saying he's gay, because the Shitennou were not developed enough to tell; I'm just saying that it's obvious that this character has some kind of personality kink, if not exactly development. The next king to come along, in contrast to the other three, did have some sort of development. Kunzite has a problem when it's his turn as front-running king. He is a rather melancholy sort at this point, and this is all because he misses his friends. He seems in a state of disbelief that his fellow Shitennou have all been killed, and seeing their charred corpses, stored in the Dark Kingdom, is clearly disturbing him. Chalk one up for the manga version of this guy! The anime Kunzite spent maybe an entire minute on-screen depressed about Zoisite, his lover; manga Kunzite was haunted throughout his entire time as a Dark Kingdom headboy (my term, not the manga's!) by the loss of the other three of the Shitennou, his friends. ...and, much like in the anime, she becomes upset, and she cries, and the ginzuishou falls from her tear as she becomes the tsuki no princess. Weird stuff happens then... particularly of interest to the Dark Kingdom is that the dead kings come back to life, and all four of the Shitennou are bombarded with glimpses of their past lives, of how they turned from their prince, Endymion, when the Dark Kingdom took them over, of how they were reborn to find him, but became corrupted by the DK again. The interesting thing, though, was when he found Endymion, lying on a bier, he knelt to him as 'master'. Obviously, the ginzuishou had had an effect on Kunzite's memories. 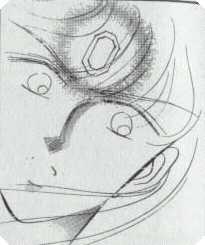 But Beryl, realizing Kunzite's newfound clarity of thought, activated the stone in his head (which would remain visible until his death), and basically turned him into a mindless zombie. He no longer questioned any of her orders, and instead set out to turn all of Tokyo to ice. When the senshi showed up to stop him, he took them to battle in space, certain they'd be helpless. Oh, but the senshi had just been to space, learning about their pasts, so with a swift 'Sailor Planet Attack', Kunzite bit the dust. Well, more accurately, he turned into dust... and a kunzite gemstone. Now, the remaining members of the Dark Kingdom were Endymion, Beryl, and Metallia. I'm not going to discuss evil Endymion in much depth. He has a story, but it's more hero- than villain-centric, so I won't go into it much. Basically, he confused poor Usagi-chan by posing as Motoki's friend Endo (poor Motoki was hypnotized, but gemstone-interested Reika was just confused, because she knew Endo did not look like that! ), then later he attacked them. His mission was like the that of the Shitennou; to kill Sailormoon and to retrieve the ginzuishou. He had scary blacked eyes and a constant weird expression. In the final battle, he actually died after Beryl did (and I'll discuss her death to a greater measure in a moment), and this was by Sailormoon, under extreme duress from his attack, who stabbed him, then stabbed herself. Needless to say, they didn't stay dead, but that's a tale for another time. So let's move on to the reason for which Endymion was kidnapped, shall we? Unlike in the anime, Beryl's origins in the Dark Kingdom are well documented. A young woman in the Silver Millenium, she unfortunately happened upon a hole around the North Pole. Venturing in, she encountered the ruins of a kingdom buried underground, and there she released and came under the control of an evil concentration of energy known as Metallia, and thus, the Dark Kingdom was created, with Beryl as priestess to the demon. She did not have the throne that she had in the anime, and indeed, was much more mobile. Once all the Shitennou were dead and Endymion was in the heat of battle, Beryl took her turn at fighting the senshi. She reached out with her hair to put Sailormoon in a chokehold, at the same time explaining the origins of Metallia (who fell to the earth from a sunspot), but, just after she had finished her evil shouting, Sailorvenus took a sword from the moon, made from a poisoned stone strong enough to scratch diamond, and killed her. In fact, she ran her right through. Though clearly not a heroine, Beryl was much more easy to feel for in the manga than the anime, for the manga shows what she'd been like before her time under Metallia. A lovely creature, a member of the earthen palace, she was in love with the prince, and he was all she'd ever really desired in her life, but he loved the princess Serenity of the Moon. It was her jealousy, and her anger at being scorned, more than likely, which turned this palace girl into Beryl of the Dark Kingdom. Metallia's promises of power for vengeance turned the woman, warped her. She began a rebellion on the earth, and somehow (though this was not explained) managed to wrangle Endymion's guardians away from him to become the Dark Kingdom Shitennou. Eventually, she was responsible for the deaths of both Endymion and Serenity. Her attack failed when Serenity's mother Serenity utilized the ginzuishou to destroy her and her warriors and to seal Metallia off. But Endymion, of course, was destined for another. And so it goes in the soap opera that is Bishoujo Senshi Sailormoon. The true villain in the season was the Great Leader of the Dark Kingdom, Queen Metallia, who was not an orange blob but a black cloud with a face. Metallia was pure evil, from a sunspot, and the final battle between the creature and the senshi was quite a lengthy one. As would be expected, though, with the help of the ginzuishou, true love and friendship, and a little... outside assistance... Sailormoon was able to defeat her. What outside assistance? Why, Endymion kept some little trinkets in his pocket all this time... shards of a few various semiprecious stones. A jadeite... a nephrite... a tanzanite (as Reika explains, another name for blue zoisite)... a kunzite. And, after Sailormoon stabbed Endymion the kings materialize, wearing their guardian's uniforms from the earthen palace. 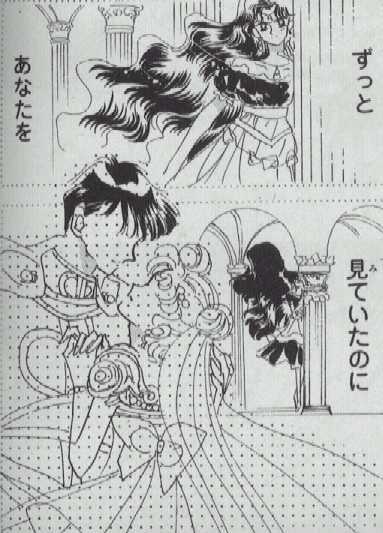 They revive their prince and heal his wounds, then Kunzite, as spokesman, tells Endymion that Metallia's weak point is her forehead, and it is with that help that Metallia is defeated, and the Dark Kingdom (which, incidentally, is a vast, columned building underground, rather than the cave-ish formation of the anime version; check out the architecture behind the first solo-Zoisite pic for an example!) was destroyed. 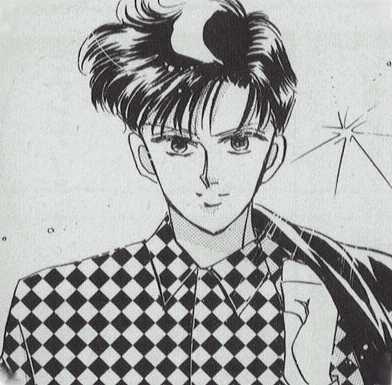 Apparently, the Shitennou show up a few times later in the manga as well, as Mamoru's advisors. So in the manga, they weren't even really bad guys at all. The Dark Kingdom of the manga did a lot of changing when it became the Dark Kingdom of the anime; the anime interpretation was quite liberal. I mean, come on! I can't be the only one who thinks that the floating-in-midair-cross-legged pose worked much, much better on Zoisite than it did on Kunzite, right? I have to admit, as well, that I think the uniforms of the kings got some improvement later on in their animated forms. Kunzite wears some pretty hideous white pants, and the other Shitennou, in black pants (and sometimes white boots), don't look much better. The uniforms look more... well, uniform, in all gray. Zoisite here, in his wild grab for Sailormoon (while yours truly swoons at the pretty hair... oh, but I love the kings' hair in the manga), displays another facet of the design of BSSM manga villains that I find universally appalling (in fact, the cross-legged Kunzite above demonstrates the same feature) -- the insane grin. It's almost like the evil version of going super-deformed, and it makes the character lose much of his humanity. It's just a part of being a manga villain, I guess. And the kings in this case are, of course, manga villains. So it's no wonder that they possess this trait. And now I suppose I have to get to the section I was most dreading in this shrine. You know, the one where each of the Shitennou is paired up in a romantic position with one of the senshi, with Endymion and Serenity on the other side. No, I'm not going to include the picture. I don't like it, and I think it was a huge mistake on Takeuchi-san's part, and besides, there are a million other places where you can find it. If you haven't seen this picture, just look. It won't be hard. This picture has spawned many, many fanfics which match up Kunzite and Venus, Jadeite and Mars, Zoisite and Mercury, and Nephrite and Jupiter as being true, destined loves, and this bothers me. 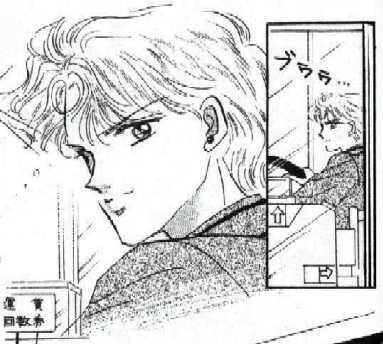 There are no indications of this in the text of the manga, save Jadeite finding Rei attractive (but come on! he's right; she's beautiful -- but that's no indication that they were together in the past! ), and Venus' apparent crush on Kunzite (which is never said to have been reciprocated). I do give you that I am a diehard Kunzite/Zoisite fan, and as such may be biased. 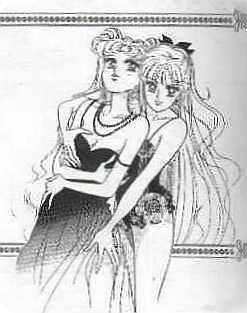 But I also think that Minako looks utterly wrong with Kunzite (and I'm not just saying that as a K/Z fan; though I don't like the other pairings either, I don't think they clash nearly as much as this one does). But the fact remains -- the one picture is not gospel; there are scores of Takeuchi Naoko's drawings and paintings that are mere whimsy, and have no place in her storyline, and I believe this is one of those types of drawings. And so as evidence I'll include the picture that I've seen referenced by anti-Shitennou/Senshi advocates in the past. (incidentally, this is the one picture in this section that I actually scanned myself!) Yes, the infamous Minako-groping-Usagi-in-lingerie picture. You think that Jadeite holding hands with Sailormars implies that they are star-cross'd soulmates? What does this little pic imply, then? And it's from the manga, from the pen of Takeuchi Naoko, just as much as the other one is. Of course, that song also has such sensible lines as "If we rally together it will be a peppermint storm!" And that sums up my belief of the whole Shitennou/Senshi pairing (and, I suppose, the Sera Myu musical... I haven't seen it, but the research I've done on it and the songs I've downloaded from it scare me) -- it doesn't make sense. So I'm not going to spend any more time on this. Apologies to fans of this pairing, but I just don't see it, and as such I'm not going to devote any more space to it. Ah, well, I suppose this already-overlong shrine needs to wrap itself up. There certainly are things about the Dark Kingdom in the manga that I enjoy. I particularly like their closeness -- while I think some rivalry may have added to that (there's nothing that says Zoisite and Nephrite couldn't have fought amongst themselves while remaining part of the unit, and nothing that says there couldn't have been a little competition amongst them), the increased level of interaction between them on a different level -- Jadeite, Nephrite, and Zoisite all appearing in a scene, for example, or the multiple group shots that the anime definitely lacks. This version also carries much more history to the group of villains. 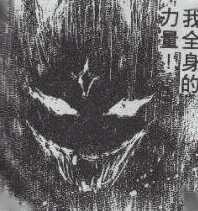 The manga Dark Kingdom and its characters may have a backstory, however, but many of them -- particularly the Shitennou -- lack the characterization created by the combination of Toei Animation's changes and designs with the exceptionally talented seiyuu who played the parts with the increased number of appearances/storylines. And yes, youma make a difference, too. Thus, the characters in the anime -- most of them, that is -- gave off a much stronger sense of being believable... though the animation was generally nowhere near as pretty as the manga's artwork. I still like the anime much, much better. But hey! The manga was a pretty worthwhile read, too. And you gotta admit, sometimes we just look good.